As many of you know Patrick and I just got married! And with that comes registering. We were so humbled by the generosity of our family and friends. Our registry experience was probably a bit different than others because, for the past two and a half years, I was the lead registry consultant at our local Macy's. I gained a lot of product knowledge and registry information during this time! I imagine our registry would have been a lot different had I not had this opportunity. So I thought it would be fun to walk you through some of our registry decisions and why we decided to register for what we did. Let's start with fine china! Many "millennial couples" choose not to register for fine china nowadays (I would say we saw about half of our couples register for fine china). I really like this article from The Knot about everyday vs formal/fine china. Some of the reasons we heard for not registering for fine china included: my mom never took hers out of the china cabinet so I know we won't use it; they will be inheriting a set (or a few sets); they're scared they'll break all of it; it's too expensive. After you get past the sticker shock of a place setting (usually averages around $100) I tend to recommend registering for fine china. The place setting includes dinner plate, salad plate, bread and butter plate, teacup, and saucer. My mom rarely took hers out of the china cabinet and I will probably inherit that set but Patrick and I love cooking and entertaining so we knew we wanted it. I also committed to using it. I think there's just a mental block on not using the fine china and if a couple can get over that then they, too, will use it and enjoy it. It's a myth that fine china is fragile. Most fine china place settings are bone china which is the strongest material china (everyday or fine) can be made of. Wikipedia defines bone china as "a type of soft-paste porcelain that is composed of bone ash, feldspathic material and kaolin. ... Developed by English potter Josiah Spode, bone china is known for its high levels of whiteness and translucency, and very high mechanical strength and chip resistance." Patrick and I had quite the journey selecting china (as many couples do). Deciding on china together is hard! Since we had a 16 month engagement we had plenty of time to make a selection for our pattern. When I first starting working at the registry desk I was drawn to the more simplistic patterns but the longer I worked in front of the china display wall the more the simplistic patterns faded into the background and I was drawn to something with more pattern. Patrick stayed true to his original favorite and eventually I came around to it. Below is the stock image of what we selected: Waterford Brocade. To me this pattern has a classic elegance to it. It is something that is not trendy and we will be able to use it even when we are serving a holiday dinner with grandchildren... at least that's the plan! Another note I wanted to add about couples not wanting china when they get married is that china is a long term investment. As I just mentioned we plan to use this set throughout our entire marriage. Since it is pricey we do not plan to pick out a new fine china set in 5-10 years but we may want to swap out our everyday dishes. This turns out to also be a reason why I recommend china: your family and friends want to give you nice gifts to start out your marriage. In fifteen years when you have changed your mind and want a china set, there will be no gifts of place settings. At Macy's we certainly had older couples come buy fine china service for 10 because they "didn't want china when they got married" so I recommend registering for it now even if it is something you may grow into! 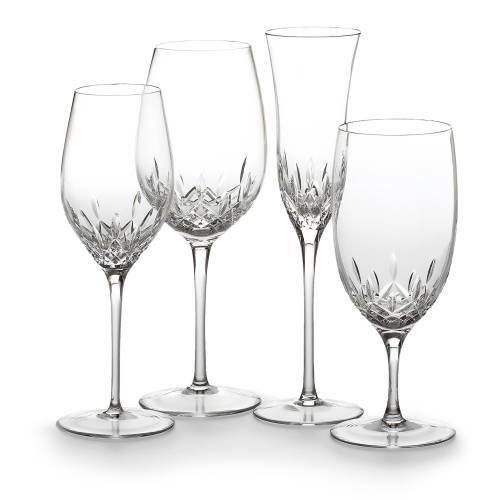 We chose the Waterford Lismore Essence pattern. This decision was much easier than the china mainly because I wanted to register for something in the Lismore family. My mom registered for the original Lismore pattern. The Waterford Lismore pattern is one of it's most popular patterns and just celebrated it's 60th anniversary. 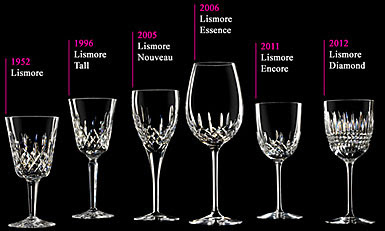 In those 60 years Waterford has introduced 5 other Lismore stems with those classic Lismore cuts but in various shapes and sizes. By registering for one of those more modern Lismore stems Patrick and I will be able to seamlessly use both of the sets together. Patrick and I chose Lismore Essence because it had the most modern feel to us and we liked the shape of Essence. 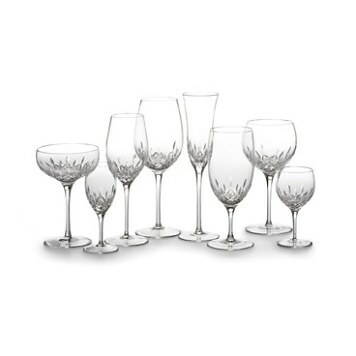 The standard suite of stems to register for are the white wine goblet, red wine glass, flute, and all purpose glass (as seen below). 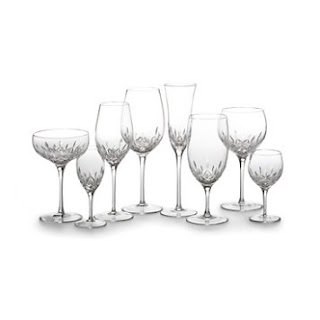 You may notice that the red wine goblet and white wine glass are identical in shape so for this reason we planned to register for the white wine glass (and use it for white and red wine) and the all purpose glass. We do not foresee regularly entertaining with champagne and therefore did not register for champagne flutes. When couples ask what they should register for I always ask them how they envision entertaining. Waterford loves to produce a full range suite of stems as compared to other vendors. Below is the full selection of Lismore Essence stems. The second stem from the right is a balloon red wine glass and we opted to register for these as well so now we have a red wine, white wine, and all purpose (for water or tea) stem. And just one final stem to share (or two)! This is the Lismore Essence Platinum flute. Many vendors produce a "platinum" version of their most popular stems which is basically a small platinum rim on the stem. Since we needed toasting flutes for the wedding I surprised Patrick last Christmas with two Lismore Essence Platinum flutes. 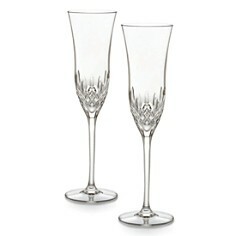 I wanted them to match our pattern and have the platinum rim differentiate them so we can always know we toasted with these flutes on our wedding day. And we enjoy a glass of champagne every now and then so it makes sense to have two. I mentioned being committed to using the china and, true to my word, we've used it for the past two monthly anniversaries! Be on the lookout for those posts and a post about how Brocade inspired the wedding.